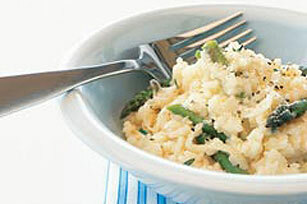 Creamy risotto gets a fresh makeover when mixed with fresh asparagus and topped with Parmesan cheese. Best of all, it's ready in just 20 mins. Melt butter with olive oil in a deep skillet on medium heat. Add onion and garlic; cook 2 to 3 minutes. Do not brown. Toss in rice and stir to coat the rice. Add warm broth, milk and asparagus. Bring to a boil over medium heat; simmer for 5 minutes over low heat. Mix in 1/4 cup of the Parmesan cheese, salt and pepper. Sprinkle with remaining Parmesan cheese just before serving. Watching saturated fat? Omit the butter and increase the oil to a total of 5 Tbsp. to save 4 g of saturated fat per serving. Add 1 cup diced Virginia ham.